MarTechExec selected the winners based on their demonstrated passion for marketing technology, and their dedication to creating a community of strong and talented marketing executives. Valerie leads all marketing for Outsell, which provides an AI-driven marketing automation solution to auto dealers. Since joining the company nearly three years ago, Vallancourt has transformed marketing, developing a demand-generation engine and implementing new processes for lead generation and tracking. These efforts significantly improved inbound lead flow while improving quality – helping Outsell exceed its sales goals. Valerie also champions women to be a part of the automotive industry. 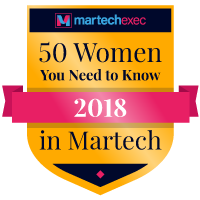 For more details about the “50 Women You Need to Know in Martech 2018” and the full list of winners, visit MarTechExec.